We human beings are often disappointed in relationships we thought had promised more than we received. We may often find ourselves let down by someone whom we were in relationship with and who never showed up. Or we become disillusioned with our own ability to trust others and wonder why we get burned over and over. This online course is divided into 6 modules with a number of sessions in each module. The course is designed to view each session and do the assignments before moving to the next session. The modules were created with the intent to build on each other, consistent with how research tells us trust is built, from the inside out. Module One – I teach you how to increase your awareness of danger zones and how to recognize when shame hijacks your brain. I will give you tools and help you develop the skills to maintain a sense of sanity and peace. I will teach you exercises that will strengthen your ability to reduce anxiety, effectively establish boundaries, and maintain safety in your inner world as well as your outer world and relationships. Module Two – I will teach you exercises and provide tools that are proven to lower anxiety and reduce the power of trauma and shame in your life. We all have stories in our heads about ourselves. These stories often create panic without any basis in reality, and yet they can overwhelm and take over our better adult thinking. I will teach you how to rewrite healthier stories. Module Three – In this module I will cover, in a very simple and gentle way, how to establish a safe spiritual connection with God. I will teach easy “how to” steps that will enhance your journey in this area without getting into controversial theological issues. This module leads to a deeper trust in today by letting go of yesterday and tomorrow. 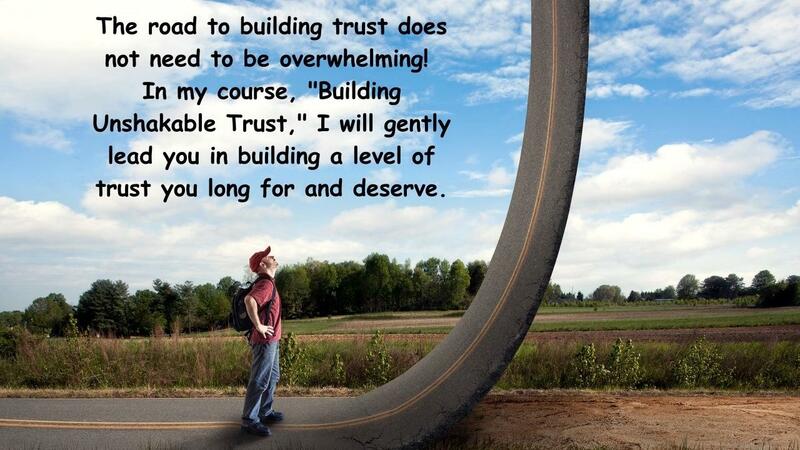 Module Four – Here we begin the foundational work of building a future trusting relationship. We begin with a clear vision of what you desire, what steps to take, and how to count the cost of the journey. Also, I will help you develop the boundaries needed to protect this treasure and dream. Module Five – Now we begin to clarify what is required to be a safe person, how to recognize such a person and what it will take to earn the trust back. Also, we will gain a vital understanding of why grief plays such an important part in the rebuilding trust. Module Six – We take everything you've learned to this point and begin constructing a strategy for the relationship you both want - one of honesty, vulnerability, and trust. You learn steps to healthier conflict resolution, how to navigate around danger areas and how to achieve mutual safety in your relationship. In this six week course Eli draws from forty years of counseling experience and 30 years specailizing in providing intensive sexual addiction treatment and recovery for thousands of clients. Eli is also including with this offer a free membership to his video blog page. He will be answering questions weekly to participants in the course. This is designed to provide as personal an experience as possible while you work through the course. This product normally sells for $197.00. However, for a limited time, I have discounted the price to $97.